Here are the 12 uniform snub polyhedra, many of them are chiral and therefore has a twisted appearance. 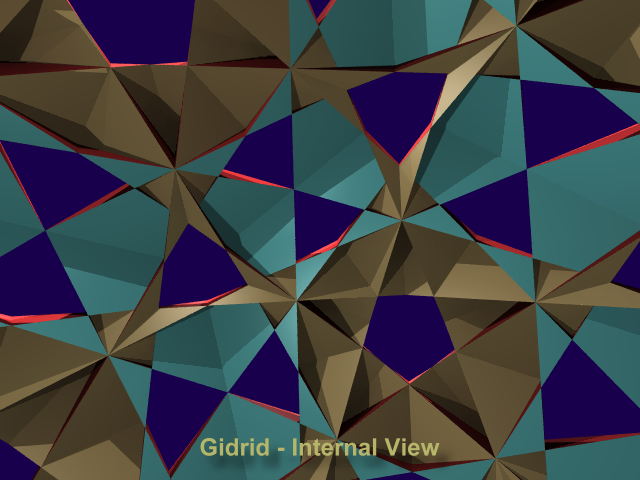 The first two are convex and therefore are part of the Archimedean solids. Due to the neo filling, two of these appear somewhat different than their traditional fillings, so I pictured both fillings here. 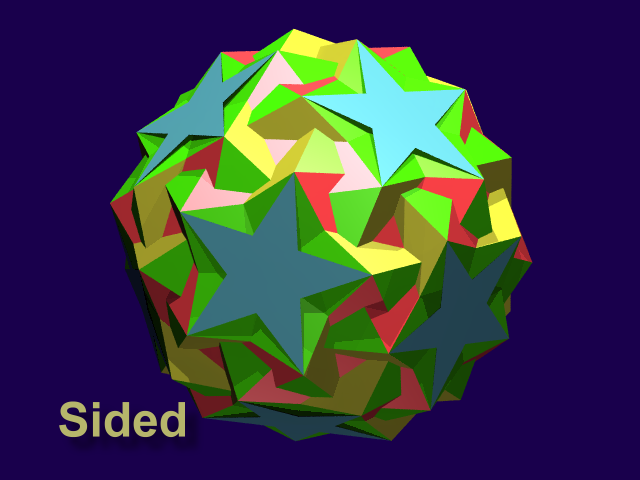 Snub polyhedra have faces that do not land on any symmetry axis, these faces are called the snub faces. All of these are orientable. 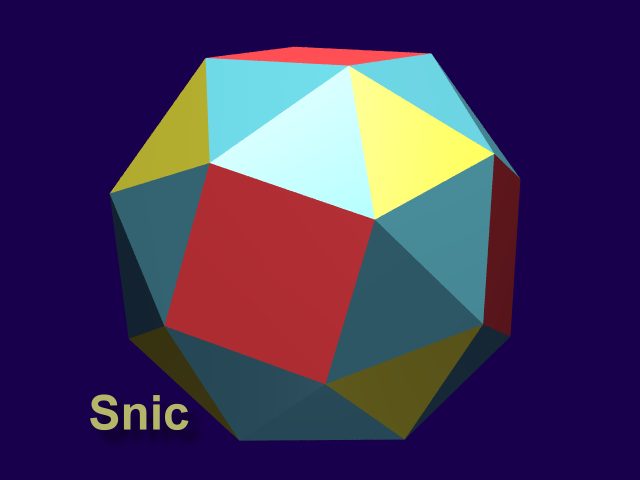 Snic has 24 vertices, while the others have 60. Only seside and sirsid show up as cells in non-prismatic uniform polychora. The polychoron categories most similar to this one are 20 (snub part), 27, 28, and 29. 64. Snic - (SNIK) snub cube, or snub cuboctahedron. Symbol is ss's. Faces are 6 squares, 8 triangles, and 24 snub triangles. 65. 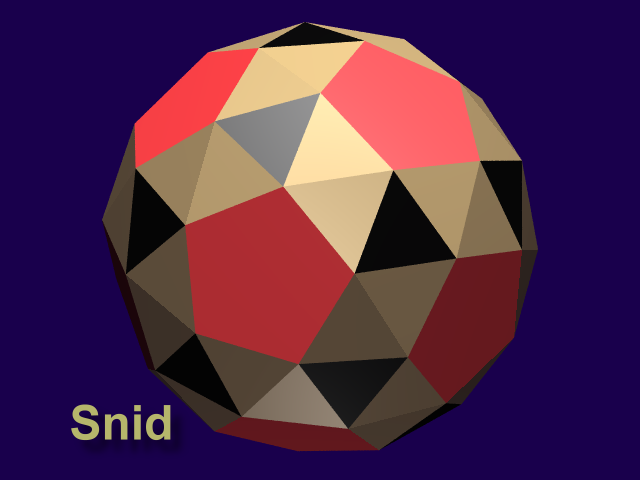 Snid - (SNID) snub dodecahedron, or snub icosidodecahedron. Symbol is ss^s. Faces are 12 pentagons, 20 triangles, and 60 snub triangles. 66. 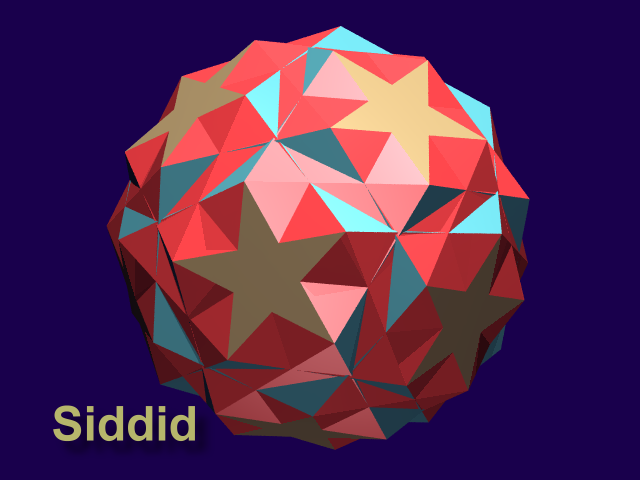 Siddid - (SID did) snub dodecadodecahedron. Symbol is s*s^s. Faces are 12 pentagons, 12 stars, and 60 snub triangles. 67. 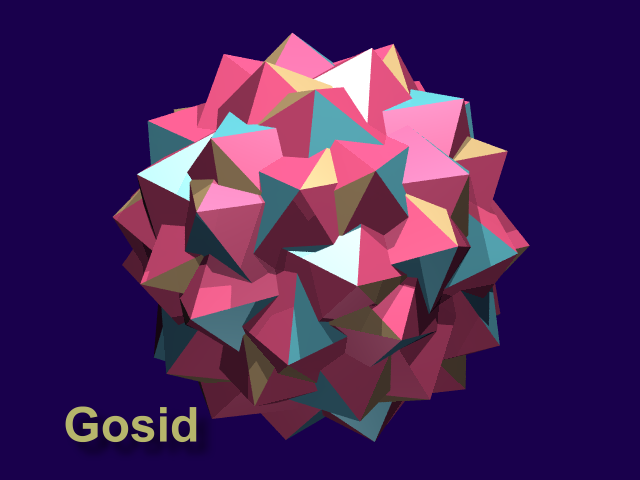 Gosid - (GO sid) great snub icosidodecahedron. Symbol is ss*s. Faces are 12 stars, 20 triangles, and 60 snub triangles. 68. 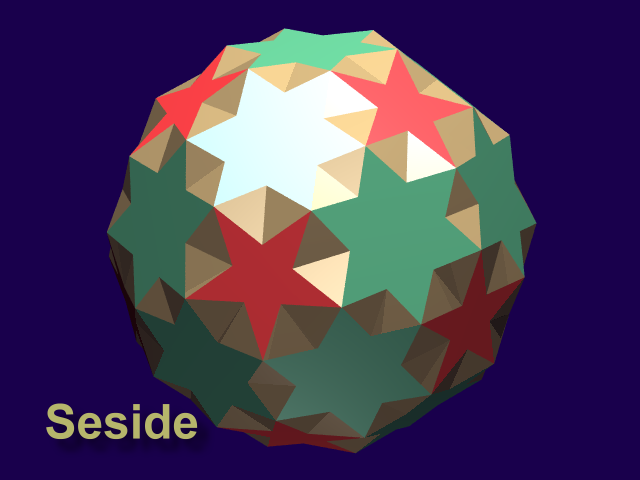 Seside - (SEE side) small snub icosicosidodecahedron. Symbol is (ss*s). Faces are 12 stars, 40 triangles (doubled up in 20 combofaces), and 60 snub triangles. This one is not chiral. 69. 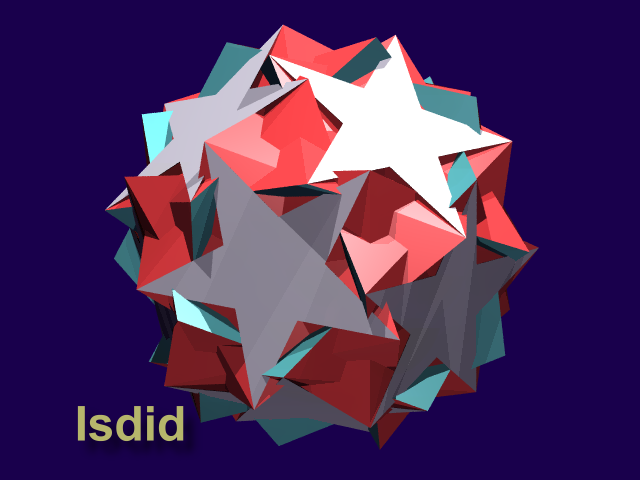 Isdid - (ISS did) inverted snub dodecadodecahedron, also called vertisnub dodecadodecahedron. Symbol is s*'s^s. Faces are 12 stars, 12 pentagons, and 60 snub triangles. 70. 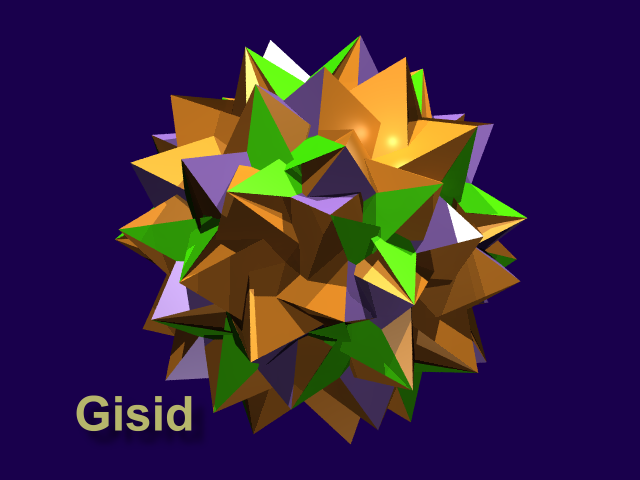 Gisid - (GI sid) great inverted snub icosidodecahedron. Symbol is ss*'s. Faces are 12 stars, 20 triangles, 60 snub triangles. 71. Sided - (SI did) snub icosidodecadodecahedron. Symbol is (s*'s^s). Faces are 12 stars, 12 pentagons, 20 trinalges, and 60 snub triangles. 72. 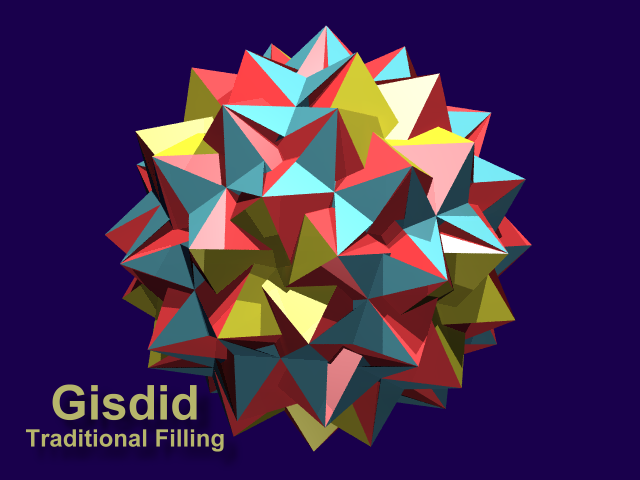 Gisdid - (GISS did) great snub dodekicosidodecahedron. Symbol is (s*'s*s). Faces are 24 stars (doubled up in 12 combofaces, where each has a positive and a negative density star), 20 triangles, and 60 snub triangles. The neofilling is slightly different from the traditional filling, but nearly identical. 73. 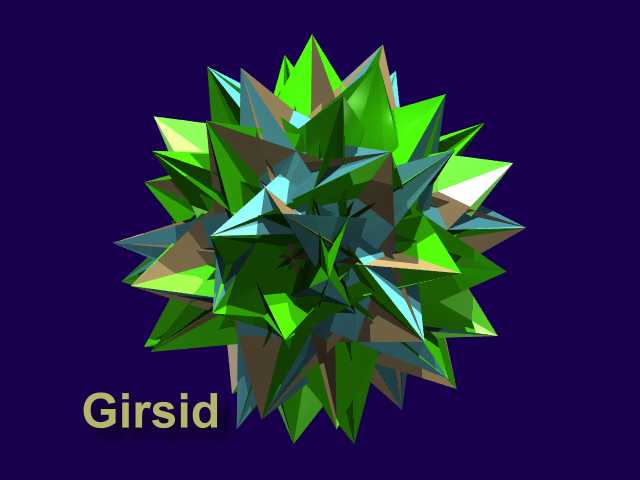 Girsid - (GIR sid) great inverted retrosnub icosidodecahedron. Symbol is s*'s,s. Faces are 12 stars, 20 triangles, and 60 snub triangles. This one is quite impressive. 74. 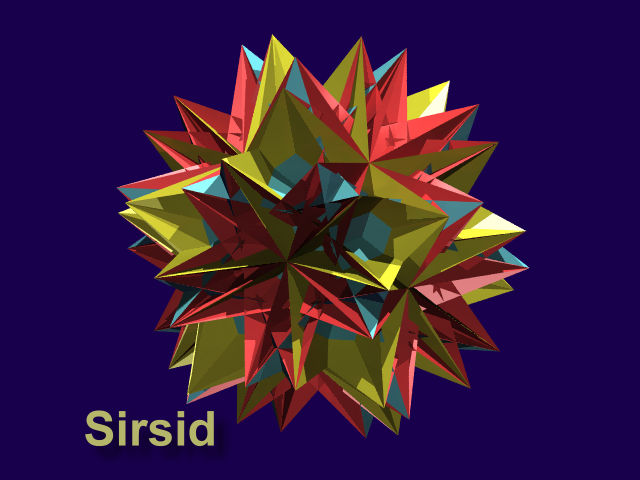 Sirsid - (SIR sid) small inverted retrosnub icosicosidodecahedron. Symbol is (s,s*'s). Faces are 12 stars, 40 triangles (in 20 combofaces), and 60 snub triangles. This one is not chiral and it's the most complex looking uniform polyhedron. 75. 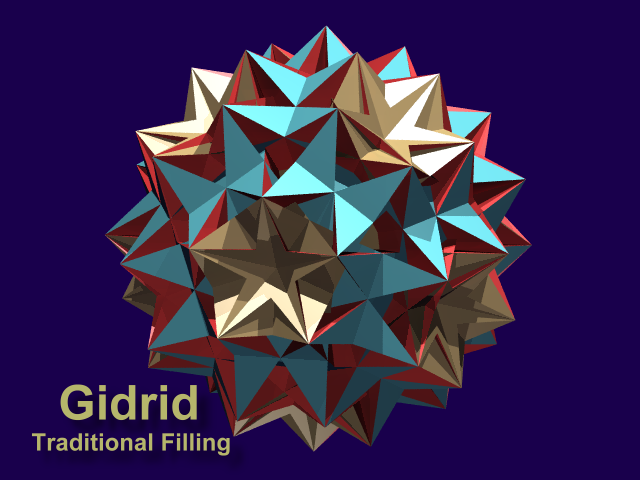 Gidrid - (GID drid) great dirhombicosidodecahedron. This one is non-Wythoffian. Faces are 24 stars (doubled up), 40 triangles (doubled up), and 60 snub squares (doubled up and going through center of polyhedron). Not only does all of its faces double up, but they double up as a positve-negative pair which results in zero density areas on the combofaces, this is why the neofilling looks so different. The neofilling makes gidrid hollow! The traditional filling is solid. This one has eight faces meeting at each vertex and it is non-chiral.